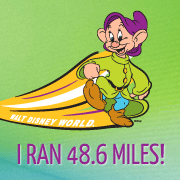 Last week I wrote that with 3 months until Walt Disney World Marathon weekend I was kicking off my Dopey training with a “half-Dopey”! Dopey is the unofficial name for when you do all 3 races during WDW Marathon weekend – the 5k on Friday, the half marathon on Saturday and the full marathon on Sunday (the half and full are officially called Goofy’s Race and a Half Challenge). In yoga teacher training we talk a lot about modifying poses and making your practice your own. In yoga classes I’ve heard teachers say things like, “be your own teacher”, “do what feels right for you right now” and “listen to what your body is telling you”. I love that yoga is an open practice and can be modified to accommodate yogis of any shape, size, age, ability or energy level, it truly makes it accessible to everyone! 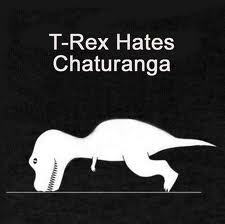 Like for those of us who struggle with chaturanga because of pathetically weak arm strength…there’s a modification! I strongly believe that in any physical activity, no matter what it is, you need to listen to your body. If you know how to listen, your body is telling you exactly how it feels and what level activity it’s up for on a given day. Yogis understand that just because you can do a pose beautifully and comfortably today, doesn’t necessarily mean that you’re going to be able to do it the same way tomorrow…and that’s ok! 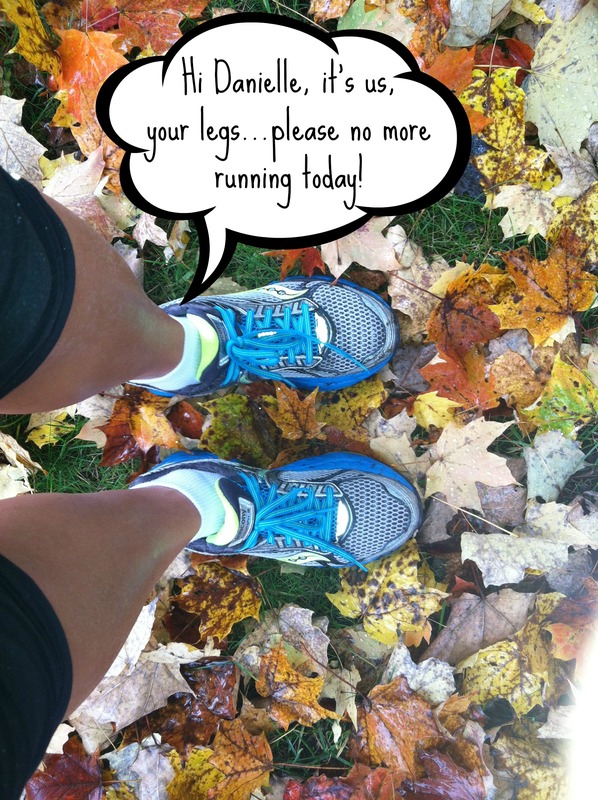 So, when my legs were screaming that they needed a rest from running I figured that was ok too! Yes, I deviated from my original plan, but I’m sure that in the long run (no pun intended!) as I go through yoga teacher training and marathon training my body will better for it (and will certainly thank me!). I had been planning on 1.55 miles on Thursday, 6.55 miles on Friday and 13.1 miles on Saturday. What I did was 3 miles Thursday (1.55 miles seemed really short! ), 6.55 miles on Friday, REST DAY on Saturday and 13.1 miles on Sunday (broken up in to 2 runs, 6.6 in the morning and 6.5 in the afternoon). So, the way I look at it I got in all the mileage I was looking for and I spared my legs – win/win as far as I’m concerned! I’m trying to be especially mindful of how my body is feeling now that I’m adding 4-5 hours of vinyasa yoga a week to my running routine for yoga teacher training. I’m totally comfortable with modifying my plans as I go along, the last thing I want to do is burn out before marathon weekend! Just read your guest post about Tower of Terror (an awful race for me) and your photos are so clear! Please tell me what you did to get such great pictures. I used my iphone and my pics are mediocre. Good luck on your Dopey training! Hi Kelley, thanks for stopping by! I actually started running with my small digital camera after I was disappointed with my iPhone pictures from the Wine & Dine half marathon last year. I got a small camera case that slides right on to my hydration belt and I honestly don’t even feel it! Totally worth the pictures I’ve gotten from my last few races! I was out for my run today and was wondering how you made out. how did you like the split run? Yes, the split run was great. I’m not sure that it totally has the same effect as doing the full run straight, but it’s definitely what my legs needed this weekend. Yoga has really helped me accept that my body is telling me things and I need to listen. It look me a long time to realize just because I could do a pose one day, doesn’t mean that I can do it the next day and then apply it to other things, like running. Good job listening and modifying your plan!